You’ll find 1hr parking on St Georges Rd, but you may find yourself here for longer than that, so we suggest finding a 2hr or 4hr park on Clauscen St.
We’re on the #11 Tram route that runs between West Preston and Docklands, and you’ll find us between stops 24 & 25. We’re also just a short walk from Merri train station on the South Morang line. 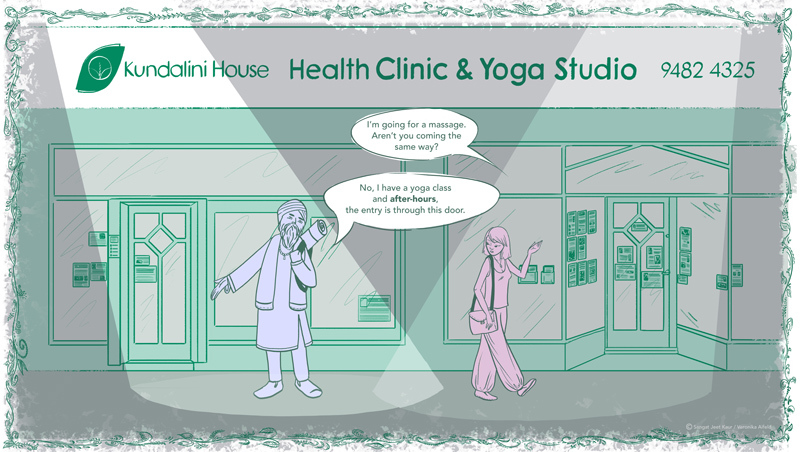 Please use the main door to our shop and clinic for all treatments and yoga classes. Clinic appointments: Please use the main shopfront entrance. Press the door bell, and your practitioner will be with you shortly. Yoga classes: Please use the security door to the left of the shopfront entrance. Press the buzzer for ‘Kundalini House’. When the teacher answers you will hear a click, and you can push the door open (push hard, as it’s a heavy door). Make your way down to the back of the corridor, up the stairs, where your teacher will greet you.